Tulip Fever stars Christoph Waltz, Alicia Vikander, Dennis DeHaan: Is the fever catching? Have you read Tulip Fever by Deborah Moggach yet? The movie, due out next year and in post-production right now, has a very impressive cast: Christoph Waltz, Alicia Vikander, Dane DeHaan, Holiday Grainger, Jack O'Connell, Zach Galifanakis and the majestic Judi Dench who starred in the adaptation of Ms. Moggach's These Foolish Things, which they retitled The Best Exotic Marigold Hotel. In fact, try to find the book now and you'll see it's been retitled as The Best Exotic Marigold Hotel too. Fine with me, it was a fantastic novel, the film was wonderful too. 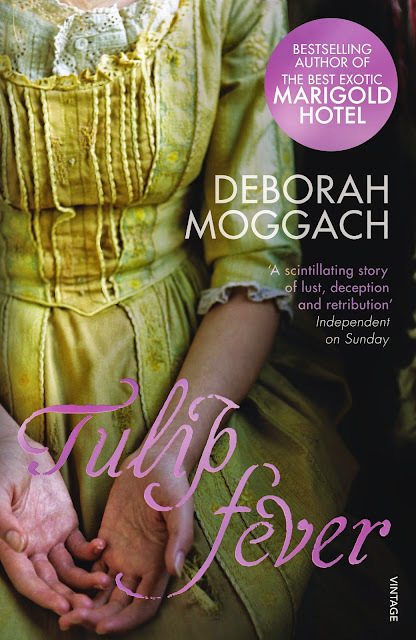 So — I just re-read my take on the novel Tulip Fever by Deborah Moggach, posted back in 2012. And darn if I didn't despise it! I wonder if it was just me — you know how if you encounter a book at the wrong time it can hit you, well, wrong? Tulip Fever sure hit me wrong! Part of what I loved about The Best Exotic Marigold Hotel was Moggach's voice, fresh, funny, and contemporary, none of which I found to hold true in Tulip Fever, basically a piece of historical fiction set during the 1630's when tulip mania swept Holland. In the past I've been a huge fan of historical fiction, not sure what went wrong here. Here's the rundown on the novel from the publisher. Honestly, I find it hard to believe I disliked it so! In my take on the book I really objected to the lack of self-control that Sophia and the young painter, Jan Van Loos exhibited, going behind Sophia's older husband, Cornelis' back. In the film Alicia Vikander — delightful as Kitty in Anna Karenina — plays the beautiful Sophia. Vikander who can also be seen in the upcoming movie Testament of Youth opposite Kit Harrington is absolutely gorgeous with the lush sensuality Moggach must have had in mind for Sophia. 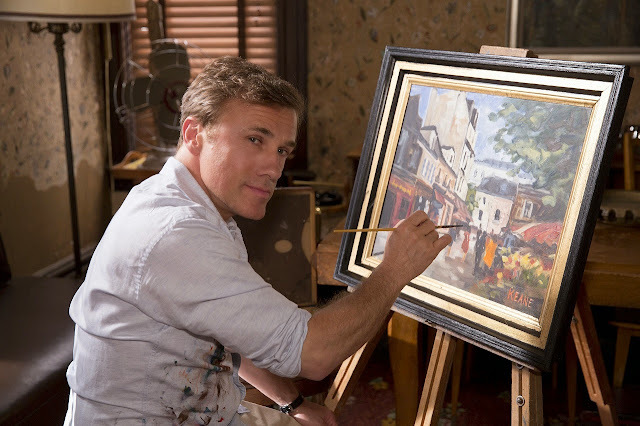 I also thought the reader should fall in love with the young painter; equally true for the movie. 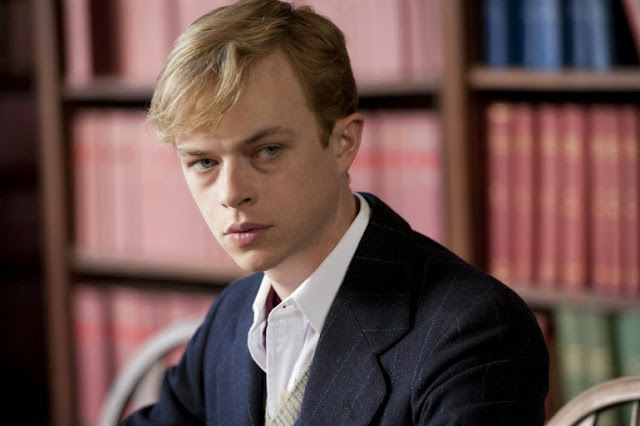 Jan is played by Dane DeHaan, an actor I'm aware of (Spiderman, Kill Your Darlings) but don't really know enough to comment on. Except to say he hasn't swept this old lady off her feet, not to date anyway. With Christoph Waltz playing Cornelis I'm not sure how DeHaan would ever get my vote. On the other hand Waltz plays bad guys really well—we loved his performance but hated his Nazi character in Inglourious Basterds and it looks like we'll be doing more of that in Big Eyes where he plays Margaret Keane's conniving and controlling husband Walter — if anyone can sell it, Waltz can. The cast is rounded out by Holiday Grainger as Sophia's maid, Maria and Jack O'Connell — up next and starring as Louis Zamperini in Unbroken— is likely playing her lover, Willem. Two very, very integral characters. O'Connell is included on the Tulip Fever IMDB cast and crew page but his part isn't identified but he's a handsome young Hollywood type so that's my feeling. The cast also includes Zach Galifanakis (maybe the last person I'd expect to see in a period film), and the devine Dame Judi Dench is the Abyss of St. Ursula in this film written by Tom Stoppard. Yes, the great playwright who won the Oscar for his Shakespeare in Love screenplay and also gave us Anna Karenina, Brazil, and Parades End. Director Justin Chadwick has some great period chops as well, counting The Other Bolyn Girl and the television program Bleak House among his credits along with the highly acclaimed Mandela: A Long Walk to Freedom. I was definitely disappointed in the book, I can't change that BUT with this cast, and this historically fascinating period, along with Stoppard's script, I can't help but think I'll be catching a little Tulip Fever myself. No official pictures to share with you yet but as soon as I get my hands on them, plus the poster and trailer, I'll post them here. In the meantime, what do you think? Do you see yourself coming down with a touch of Tulip Fever?